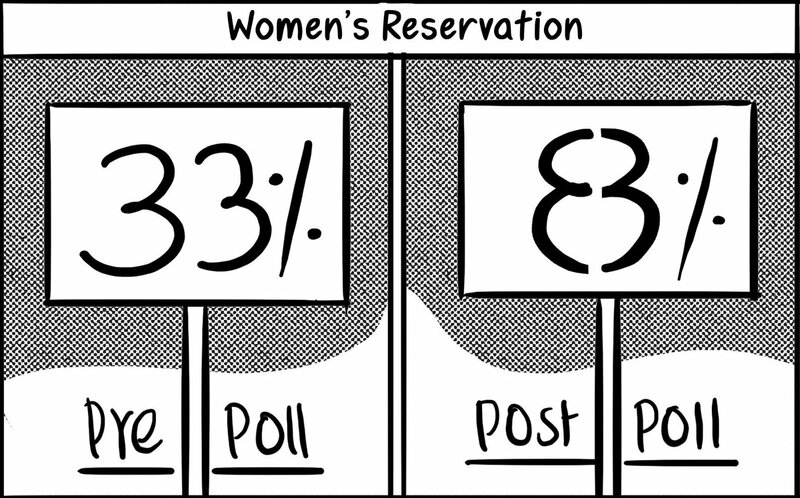 Gokul Gopalakrishnan depicts the reality of the women’s reservation in Indian legislature, despite all the political noises in favour of it. Naveen Patnaik’s BJD has given 33 per cent reservation to women among its candidates for the Lok Sabha polls, while Mamata Banerjee’s TMC has taken the figure up to 41 per cent. However, when it comes to the final analysis, women make up just 9 per cent of India’s MPs and MLAs. Alok Nirantar takes a jibe at Congress president Rahul Gandhi’s claims of uniting the country, while his own party is plagued by infighting and the inability to firm up alliances. 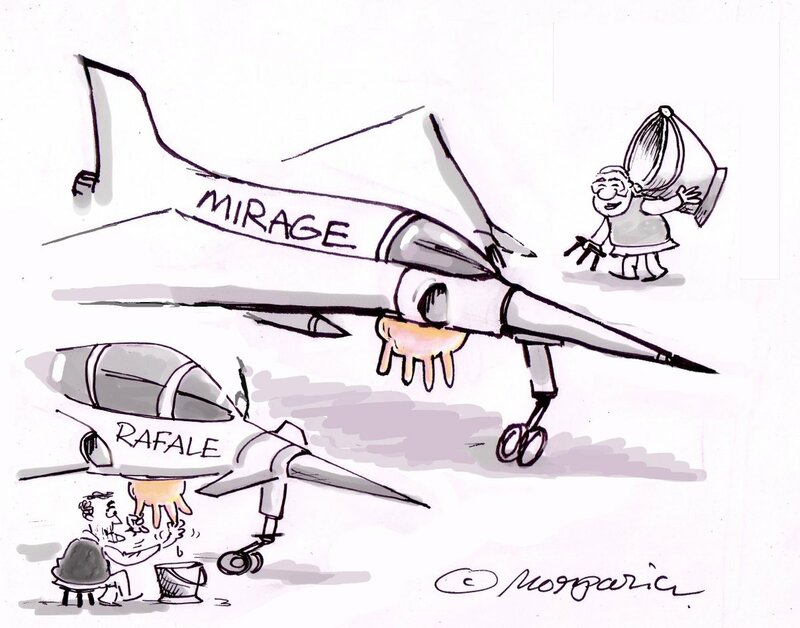 Hemant Morparia shows Rahul Gandhi milking the Rafale jet, and Prime Minister Narendra Modi rushing to catch up by milking the Mirage-2000, the aircraft which carried out the Indian Air Force air strikes on Balakot, Pakistan. 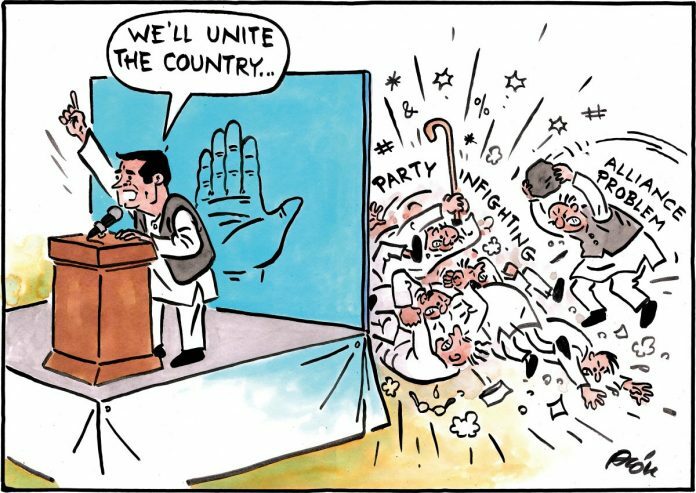 Manjul presents his take on the recent social media uproar over a Surf Excel advertisement released to celebrate communal harmony on Holi. 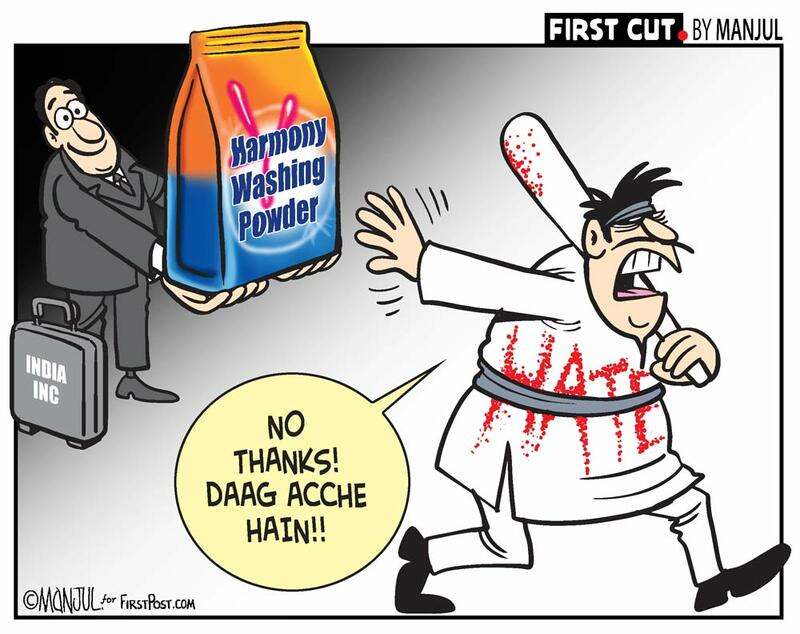 He depicts a hate-monger quoting the detergent powder’s old tagline ‘Daag achhe hain‘ (stains are good) when the businessman tries to sell him ‘Harmony Washing Powder’. In a blog post Wednesday, Prime Minister Narendra Modi made ‘four requests for democracy’ from the Indian people ahead of the Lok Sabha polls. 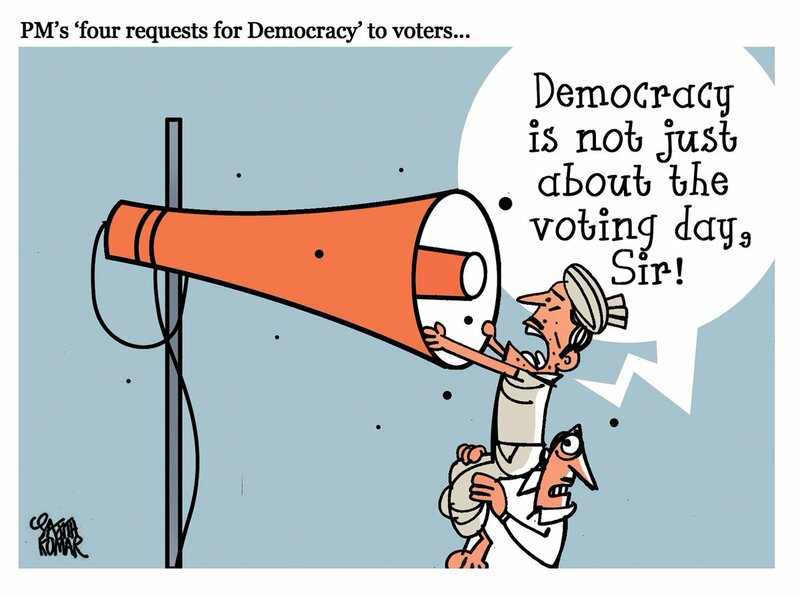 Sajith Kumar illustrates an Indian voter trying to remind the PM that democracy isn’t just about the day of the election. 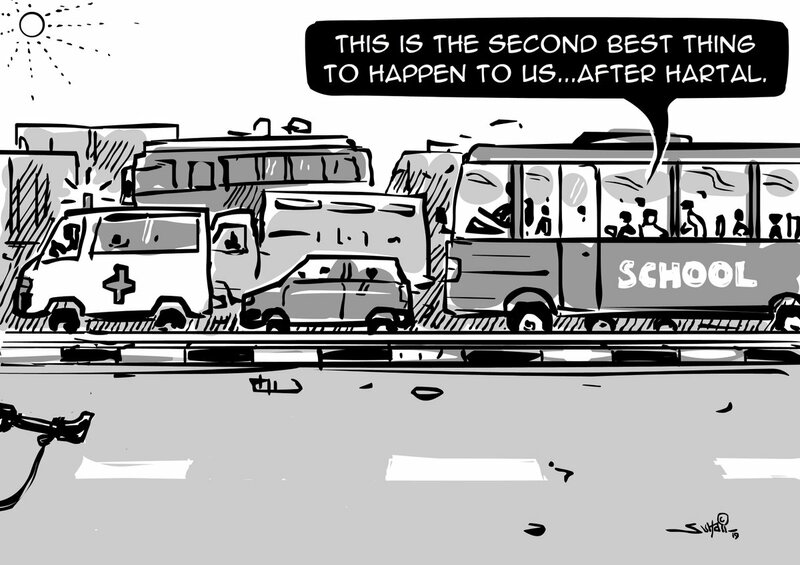 Suhail Naqshbandi depicts Kashmir’s roads coming to a standstill due to regular blockades in the valley for armed forces convoy movements, in the aftermath of the Pulwama terror attack. Schoolchildren say to each other that this is the second best thing to happen to them after the hartals and bandhs that separatist leaders call from time to time, disrupting everyday life.